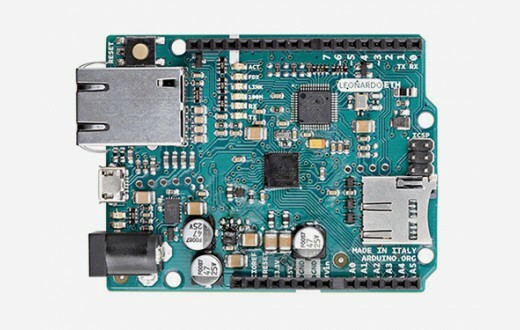 All the fun of a Leonardo, plus an Ethernet port to extend your project to the IoT world. You can control sensors and actuators via the internet as a client or server. An optional Power over Ethernet module can be added to the board as well. The Leonardo ETH has the same Wiznet Ethernet interface as the Ethernet Shield 2. An onboard microSD card reader, which can be used to store files for serving over the network, is accessible through the SD Library. Pin 10 is reserved for the Wiznet interface, SS for the SD card is on Pin 4.
added SDA and SCL pins: beside the AREF pin, two TWI pins have been added. This will allow to connect the Leonardo ETH to Shields that use the I2C or TWI bus communication for their functioning. the IOREF: it allows the shields to adapt to the IO voltage level provided by the Board. The Shield that uses the IOREF pin will be compatible with both 3V3 and 5V (e.g Due and Uno) IO levels Arduino Boards. Next to the IOREF pin you can find another (currently not in use) pin, that is reserved for future usage. Serial: 0 (RX) and 1 (TX): used to receive (RX) and transmit (TX) TTL serial data using the ATmega32U4 hardware serial capability. Note that on the Leonardo ETH, the Serial class refers to USB (CDC) communication; for TTL serial on pins 0 and 1, use the Serial1 class. TWI: 2 (SDA) and 3 (SCL): they support TWI communication using the Wire library. LED: 13. There is a built-in LED connected to the digital pin 13. When the pin is HIGH value, the LED is on, when the pin is LOW, it's off. Analog Inputs: A0-A5, A6 - A11 (on digital pins 4, 6, 8, 9, 10, and 12). The Leonardo has 12 analog inputs, labeled A0 through A11, all of which can also be used as digital i/o. Pins A0-A5 appear in the same locations as on the Uno; inputs A6-A11 are on digital i/o pins 4, 6, 8, 9, 10, and 12 respectively. Each analog input provides 10 bits of resolution (i.e. 1024 different values). By default, the analog inputs measure from ground to 5 volts, though it is possible to change the upper end of their range using the AREF pin and the analogReference() function. Reset. Bring this line LOW to reset the microcontroller. Typically used to add a reset button to shields that block the one on the board. The Arduino Leonardo ETH has a number of facilities for communicating with a computer, another Arduino, or other microcontrollers. The ATmega32U4 provides UART TTL (5V) serial communication, which is available on digital pins 0 (RX) and 1 (TX). The 32U4 also allows for serial (CDC) communication over USB and appears as a virtual COM port to software on the computer. The chip also acts as a full speed USB 2.0 device, using standard USB COM drivers. On Windows, a .inf file is required. 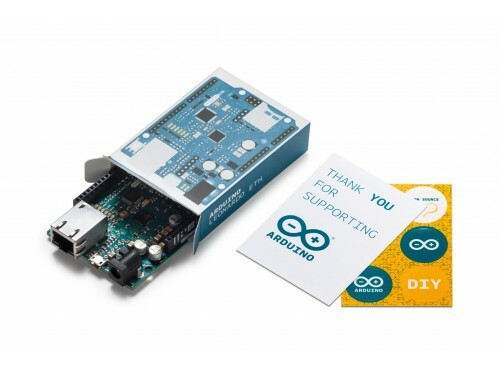 The Arduino software includes a serial monitor allowing simple textual data to be sent to and from the Arduino board. The RX and TX LEDs on the board will flash when data is being transmitted via the USB connection to the computer (but not for serial communication on pins 0 and 1). A SoftwareSerial library allows for serial communication on any of the Leonardo ETH's digital pins. The ATmega32U4 also supports I2C (TWI) and SPI communication. 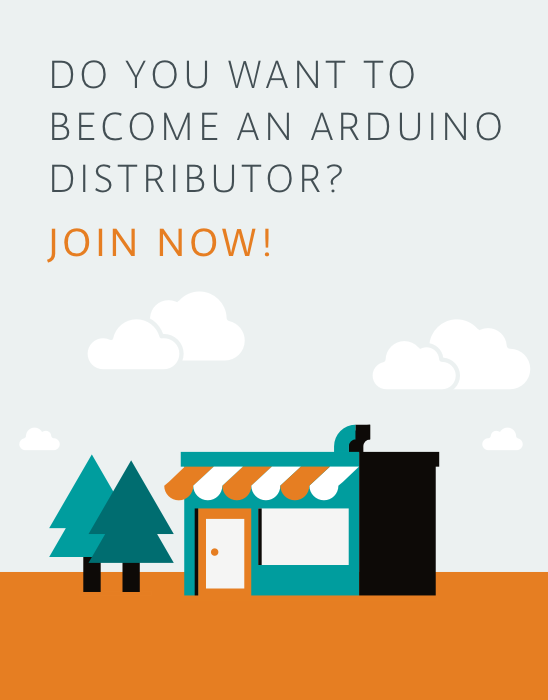 The Arduino software includes a Wire library to simplify the use of the I2C bus. For SPI communication, use the SPI library. The Leonardo ETH appears as a generic keyboard and mouse, and can be programmed to control these input devices using the Keyboard and Mouse classes. 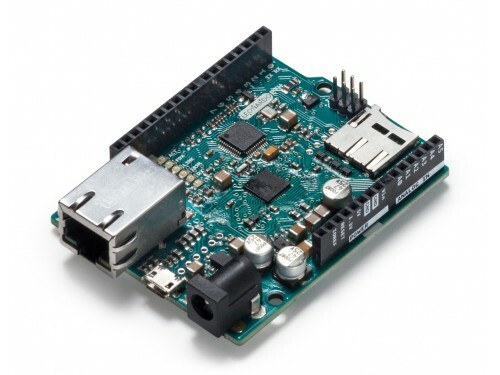 The board can also connect to a wired network via Ethernet. When connecting to a network, you will need to provide an IP address and a MAC address. The Ethernet Library is fully supported. The onboard microSD card reader is accessible through the SD Library. When working with this library, SS is on Pin 4. 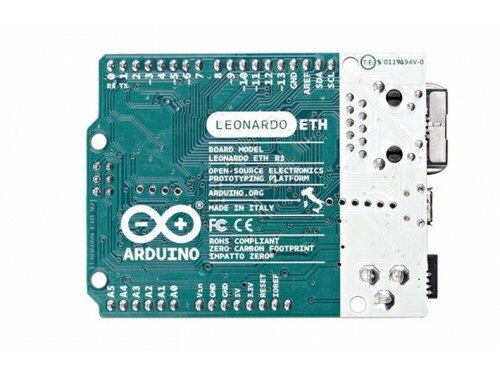 The Leonardo ETH can be programmed with the Arduino software (download). 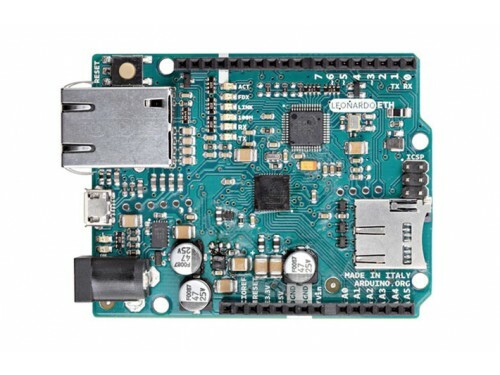 Select "Arduino Leonardo ETH from the Tools > Board menu. For details, see the referenceand tutorials. The ATmega32U4 on the Arduino Leonardo ETH comes pre-burned with a bootloader that allows you to upload new code to it without the use of an external hardware programmer. It communicates using the AVR109 protocol. You can also bypass the bootloader and program the microcontroller through the ICSP (In-Circuit Serial Programming) header using Arduino ISP or similar. All the Leonardo ETH example sketches work as they do with the Ethernet shield 2. Make sure to change the network settings for your network. Rather than requiring pressing the reset button before an upload, the Leonardo ETH is designed in a way that allows it to be reset by software running on a connected computer. The reset is triggered when the Leonardo's virtual (CDC) serial / COM port is opened at 1200 baud and then closed. When this happens, the processor will reset, breaking the USB connection to the computer (meaning that the virtual serial / COM port will disappear). After the processor resets, the bootloader starts, remaining active for about 8 seconds. The bootloader can also be initiated by pressing the reset button on the Leonardo. Note that when the board first powers up, it will jump straight to the user sketch, if present, rather than initiating the boot loader. Because of the way the Leonardo ETH handles the reset, the best thing to do is to let the Arduino software try to initiate the reset before uploading, especially if you are used to pressing the reset button before uploading on other boards. If the software can't reset the board, you can always start the bootloader pressing the reset button on the board. The Leonardo ETH has a resettable polyfuse that protects your computer's USB ports from shorts and overcurrent. Although most computers provide their own internal protection, the fuse provides an extra layer of protection. If more than 500 mA is applied to the USB port, the fuse will automatically break the connection until the short or overload is removed. The maximum length and width of the Leonardo ETH PCB are 2.7 and 2.1 inches respectively, with the RJ45 connector and power jack extending beyond the former dimension. Four screw holes allow the board to be attached to a surface or case. Note that the distance between digital pins 7 and 8 is 160 mil (0.16"), not an even multiple of the 100 mil spacing of the other pins.